Vitalik Buterin, one of the most influential people in crypto and the figurehead behind Ethereum, recently clarified his fiat holdings in response to an analysis of his transaction history on his main wallet address. Based on Buterin’s cryptocurrency wallets, cash from ETH sales, equity in startups, and his annual salary, CryptoSlate estimates Buterin’s net worth at $79 million. Accounting for the largest percentage of Buterin’s net worth, his Ethereum wallet represents the 24th largest by ETH held. With a current balance of 350,000 ether, his holdings are worth roughly $47 million with coins trading at $135 each. On Mar. 19th, Alex Sunnarborg—a founding partner at Tetras Capital, a New York city-based cryptocurrency hedge fund—conducted an analysis of Vitalik Buterin’s Ethereum transactions in an attempt to estimate his fiat holdings. Sunnarborg links current ether prices against the timing of transactions into and out of Buterin’s wallet address. 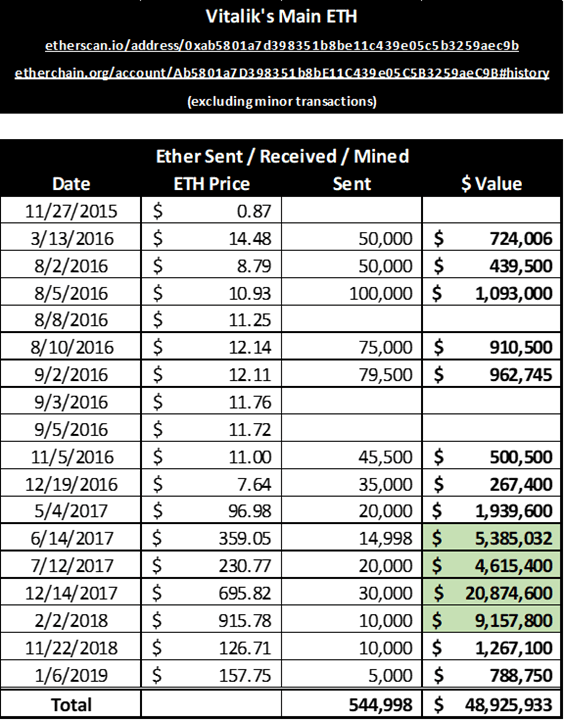 Based on these data, Sunnarborg estimates that Vitalik received $49 million for the sale of 545,000 ETH since March 2016. That said, Vitalik Buterin may have also received compensation from other sources, such as advisory or speaking engagements. For the purposes of these calculations, Buterin’s cash holdings from Ethereum sales will be estimated at $25 million. In addition to Ethereum, Vitalik Buterin also holds a variety of other coins. According to a February statement, Buterin’s ERC20 and Ethereum-related holdings, approximately: $690,000 in Maker (MKR), $625,000 in Augur (REP), $65,000 in OmiseGO (OMG), and $25,000 in Kyber Network (KNC), among other coins. These holdings total approximately $1.5 million. Meanwhile, his non-Ethereum-related holdings: Bitcoin (BTC), Bitcoin Cash (BCH), Dogecoin (DOGE), and Zcash (ZEC), all worth less than 10 percent of his total ETH holdings, according to Buterin. The exact amount of these holdings were not disclosed, but for these calculations, it will be estimated at $1 million. Buterin has also stated he has “significant” equity ownership in two corporations, Clearmatics and StarkWare. Clearmatics is a blockchain research and development software company, while StarkWare Industries Ltd. is a software company that is attempting to solve the scalability and privacy issues around blockchains. According to data from Crunchbase, between their series A and seed rounds, Clearmatics raised $13.3 million and StarkWare raised $36 million. According to information from LawTrades and Y Combinator, on average 15 percent of shares are distributed in a seed round. In a series A round, a startup will distribute 35 percent of the shares, on average. Consequently, if 50 percent of the equity in each company has been distributed, then their series A valuations should be roughly double what was raised. For the purposes of these calculations, the value of Clearmatics and StarkWare will be estimated at $27 million and $52 million, respectively. Assuming (arbitrarily) that Buterin has a 5 percent stake in each company from seed round investment, then that means his equity would be worth roughly $4 million. Finally, Buterin mentioned that he receives a salary from the Ethereum Foundation. In 2016, he stated that he was receiving $150,000 per year. Assuming his salary has remained unchanged, he has received approximately $500,000 in compensation from January 2016 to the present day. With $47 million in ETH, $25 million in cash from ETH sales, $2.5 million in other cryptocurrencies, $4 million in equity, and $500,000 in compensation, Vitalik Buterin’s net worth would total an estimated $79 million. However, the true value of his net worth could reasonably vary anywhere from $60-$110 million. Furthermore, these figures do not include Vitalik Buterin’s brand, his role in the ecosystem, and other intangible assets that are difficult to calculate but are still undoubtedly valuable. The post Vitalik Buterin Clarifies Fiat Holdings: Analysis of Ethereum Founder’s Net Worth appeared first on CryptoSlate.